The City of Douglas is responsible for collecting and disposing of residential and commercial solid waste. The Public Works Department is also responsible for removing yard debris weekly within Douglas city limits. This does not include any materials from land clearing projects or trees cut by a contractor. The Public Works Department has a contract with Transwaste Services to collect and dispose of your solid waste and recyclable material. Brown goods are any furnishings from a home, such as sofas, chairs, etc. 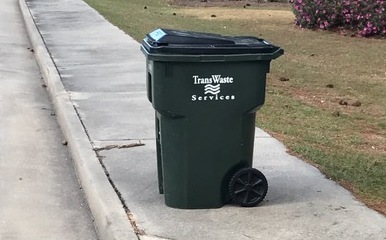 The City of Douglas has a contract with Transwaste Services, LLC, to provide collection, transportation, and disposal of garbage and recycling refuse for the citizens of Douglas. Under the contract, regular residential garbage collection will be every week and if a customer wishes to continue recycling with the VOLUNTARY Recycling Program, the customer will have to request a Recycling Cart through the Utility/Collections Department located at City Hall. There will NOT be a rate increase created by the changes. Commercial front load collection will be at various times weekly. Commerical front load type services will be provided to all businesses requiring services with 2, 4, 6, 8 cubic yard containers to be serviced from one to five times each week. One (1) free rolloff will be provided in wards or neighborhoods each month for customer use. Residents will be able to take advantage of a junk free day each month. During these Junk Free days, customers will be allowed to dispose of their large, non-hazardous household items at the City Pole Yard at NO charge to the customer. All residential solid waste stored outside the residence pending collection shall be placed in city approved trash receptacles. Under no circumstances will garbage outside of the city-issued container be collected. Customers may request additional containers for an additional monthly fee. 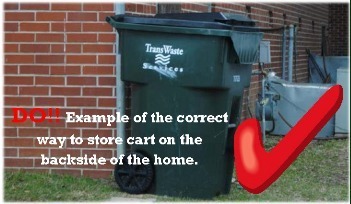 Beginning the evening before and no later than 6:00am on the day of collection, customers should place their container (s) at the curbside in front of the customer’s residence. The container should be removed from the curbside and returned to a location behind the customer’s residence or to a place that is outside of City’s right-of-way and out of view from the right-of-way no later than 6:00am following the scheduled day of service. Customers routinely allowing containers to remain at curbside outside of the hours specified shall be deemed to create a nuisance, punishable as a violation of the Code. It shall also be unlawful for any person to store any scrap tires on residential property or to willfully discard or place tires on private property and public rights-of-way. All persons engaged in scrap tire handling, within the city, shall do so in strict compliance with the requirements of OCGA 12-8-20, et. seq., and chapter 391-3-4-19, Rules of Solid Waste Management, as applicable to scrap tires. To view the Sanitation Ordinance in its entirety, please click here. For more information about these services, contact the Public Works Department at (912) 389-3450 or Transwaste Services at (912) 384-6001.